CE L’Hospitalet will spend one year more at the 3rd Division. The dream of the promotion has vanished in the first eliminatory, before a Náxara that has been much more effective than the hospitalencs. Far is the first leg, in which surely the Hospi deserved something more. The second game, at La Salera stadium full of supporters, has been key for Náxara, who has found the goal with ease. Their goals, moreover, have been those of a psychological kind: the first one, near to halftime, and the second, shortly after leaving the locker room. Tamayo and Miguel Martinez have beated Hospitalet team who, almost without realizing, was losing 2-0 in the 50th minute of the match. The third, when the match was near the end, was the icing on the cake for the locals, who have been able to celebrate the deserved classification. For the Hospi, on the contrary, it was a bucket of cold water. The final score has condemned Hospi one more year to the 3rd Division. An irregular season, in which the CE L’Hospitalet has never given the impression of believing they could achieve segond division B. 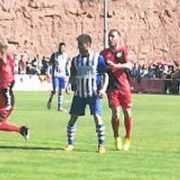 Third position in the regular season, when they could probably aim for more, was a warning that this last match in La Salera has finally confirmed.